Mill Hollow Reservoir is in the Provo River drainage south of the Uinta Mountains. It is a small artificial, stabilized lake maintained by the DWR to provide angling opportunities for Utahns. It is an isolated recreation area. 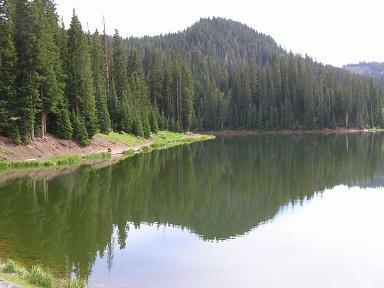 The shoreline is owned by the Uinta National Forest and public access is unrestricted. Water is never drained from the lake for agricultural use. Mill Hollow Reservoir is south of U-35 between Woodland and Tabiona. 11 miles east of Woodland or five miles west of Wolf Creek Summit, turn south off U-35 onto an improved gravel road to Mill Hollow Reservoir,	campground, and guard station. The reservoir is 3.5 miles south on this road. The route is well marked from U-35.